Weekend Tours and Pat Whitney Training. November 9, 2018 Kevin Davitt Comments Off on Weekend Tours and Pat Whitney Training. Leaving the Aldi car park at the later time of 9.30am and heading to Kilmore Quay via Murrintown and back via Drinagh. Approx. 90km. Coffee stop in Kilmore Quay. The weather forecast is OK with South West winds with shortcuts available. 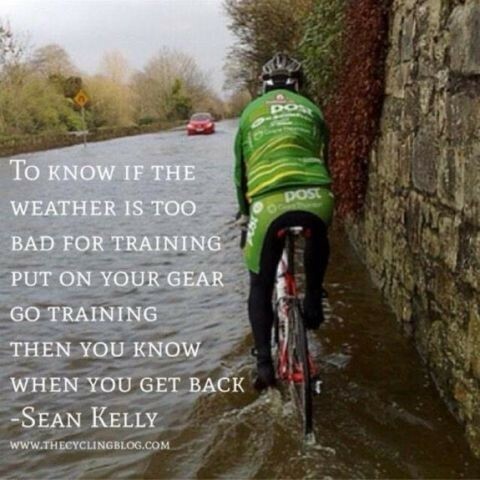 Pat’s training spin will leave from the Aldi car park at 9.30am along with Murry’s Saturday Tour and at Murntown head to Deerpark, Forth Mountain, Larkin’s Cross and back to Enniscorthy via the main roads with some drills to practice on the way home. If you don’t have a rear mudguard please get one. Clip on mudguards are inexpensive and easy to attach to your seat tube. Remember, on a wet day the rider behind you is being sprayed by your rear wheel and it’s not a nice experience when it’s happening to you. Leaving at the Pettitt’s car park at 9.30am and heading to Barntown Roundabout, Taghmon, The Whitford Roundabout and back home to Enniscorthy at a nice steady pace. With Winter now upon us, coffee stops will need to be kept to a minium amount of time as it is easy to catch a cold or worse in these cooler temperatures. Next Post:Notice For The 2018 AGM.